* Toast sesame seeds in a small frying pan over low heat , stirring every now and again until they turn golden brown – about 10 minutes. 1. Put a pan of water to boil and blanch the sugar peas for a few seconds. Fish them out and dunk into a bowl of cold water (to stop them cooking and keep them looking bright green and fresh). Blanch the broccoli for about a minute and cool likewise. 2. If necessary, add more water to the pan before adding the noodles. Cook noodles until just tender – how long will depend on the variety of noodle – your best indication is to taste a strand – it should be tender but still have a bit of “bite” to it. Drain noodles in a colander and rinse under the tap for a minute to remove excess starch. Drain well. 3. Heat the 1 tsp oil in a non-stick pan and fry the garlic for a few moments before adding the mushrooms. Toss over high heat for a minute – the mixture will be dry – that´s normal. To add a little moisture, drizzle 1 – 2 tbsp water into the pan – it will sizzle instantly and create steam to cook the mushrooms. Season to taste with a pinch of salt and pepper. Take pan off the heat once the mushrooms start to wilt – don´t overcook. Take pan off the heat and leave mushrooms to cool. 4. To assemble the dressing, combine the ingredients listed in a small bowl and stir well to combine, pouring any juices from the mushrooms into it as well. 5. 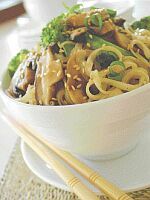 Just before serving, toss salad by combining the noodles, mushrooms and blanched vegetables in a large bowl, drizzling in the dressing as you mix. Toss, using chopsticks or salad spoons until all ingredients are evenly coated with dressing. Pile onto serving plate (or individual shallow bowls) and sprinkle with sesame seeds. Serve immediately. For added zing, serve noodles with an accompaniment of sliced bird chillies seasoned with a squeeze of lime juice.